This simple checklist can help identify dividend-paying stocks that are worthy of your money. Many income investors think that the most important metric for evaluating a dividend-paying stock is its yield. I used to think this way when I started investing many years ago. At the time, I wouldn't even consider making an investment unless a stock offered a yield that was much higher than the market in general. However, I've since learned that there is more to dividend investing than just looking at yield. In fact, I now believe that a high yield should be viewed as a warning sign instead of a buying signal. That's why I focus on other factors when judging a dividend stock. What metrics do I think investors should use to evaluate income stocks? Here are three favorites. I'm a firm believer that the best companies are capable of growing their top line in all market conditions. This isn't something that just any business can do. Many companies see demand for their products dry up when the economy grinds to a halt. However, if you can find a business that grows its revenue each year, then I'd argue that you've found a very strong business. That's why one of the first things that I look at when I'm evaluating a potential dividend stock is a chart showing its long-term revenue growth. Ideally, I'd want to see the line on the chart consistently head up. One shining example of a company with predictable revenue growth is McCormick (NYSE:MKC). The spicemaker holds a commanding market position in its industry and sells its products to both consumers and businesses. This allows it to post consistent revenue growth whether consumers choose to eat out or cook at home. By contrast, consider what's happened to General Mills (NYSE:GIS) right now. You'd think that this company would also consistently produce steady revenue growth, since it sells food. However, General Mills has struggled with top-line growth over the last few years as consumers have increasingly shifted toward organic offerings. 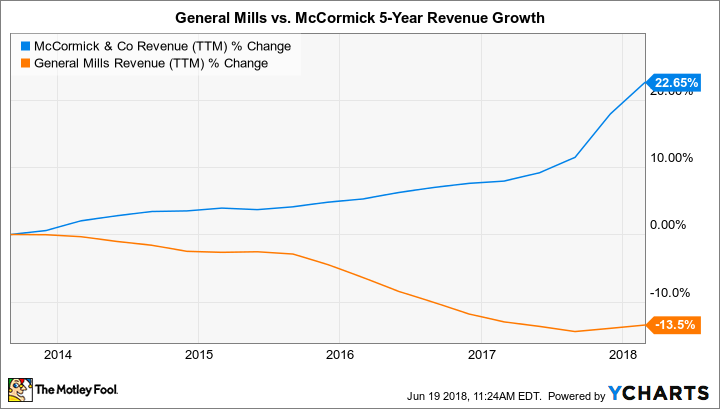 That change has put a lot of pressure on General Mills' revenue growth in recent years. MKC revenue data by YCharts. TTM = trailing 12 months. That's not to say that General Mills won't be able to turn things around. But since this company's top-line growth has clearly stalled, I think it makes sense for income investors to look elsewhere. Once I've determined that a company's revenue is heading in the right direction, I next focus on the payout ratio. This number tells us how much of a company's earnings are used to pay the dividend. To calculate this figure, you simply divide the annual dividend payment by earnings. As an example, if a company's earnings are $5 per share and its annual dividend payment is $2.50 per share, then its payout ratio is 50% ($2.50/$5). Quick math shows us that McCormick's payout ratio is 33%. This means that the company pays out about $0.33 for every $1 in net income that it earns. This ratio tells me that the company can easily afford to pay its dividend right now, and there's plenty of room for growth even if earnings do not grow. That's a great sign for dividend investors. By contrast, consider Nielsen Holdings (NYSE:NLSN). This company sells media and marketing data to companies that want to find out where consumers are spending their time. While this is a highly profitable business that shows consistent revenue growth, Nielsen currently sports a payout ratio of 113%. This means that the company pays out more in dividends than it is earning in net income, which is obviously a situation that cannot continue forever. I'm not predicting doom for Nielsen Holdings' investors by a long shot. In fact, there's a good argument to be made that cost-cutting will help drive rapid earnings growth for the company down the road. But I must admit that Nielsen's high payout ratio gives me pause. That's why I wouldn't consider this company to be one of the best dividend payers. Great dividend-paying companies can not only afford their current dividend payment but also will be able to increase their payment in the future. The only way a company can do that over the long term is to grow net income. For that reason, I like to eliminate low-growth (or negative-growth) companies from contention even if they pass my first two tests. For example, consider Consolidated Edison (NYSE:ED). This utility services New York City and its surrounding area, which is a thriving market. Selling electricity is a recession-proof business, so the company's top line is extremely predictable. What's more, the company's dividend only consumes 55% of profits. These figures suggest that Consolidated Edison might be a terrific dividend stock. However, the company's earnings are only expected to grow by just over 3% annually for the next five years. I have a hard time getting excited about that number. But this is yet another area in which McCormick shines. Thanks in large part to acquisitions and international growth, market watchers expect McCormick to grow its bottom line in excess of 10% annually over the next five years. That's quite fast for a business that is more than 100 years old. Perhaps you won't be surprised that I believe that McCormick is an excellent stock for dividend investors. With predictable revenue growth, sustainable payout ratio, and its strong earnings growth potential, McCormick checks all the boxes that I look for in a great income investment. With shares currently trading for less than 20 times next year's earning estimates and offering up a dividend yield of 2%, I think this is a great stock for income investors to get to know.